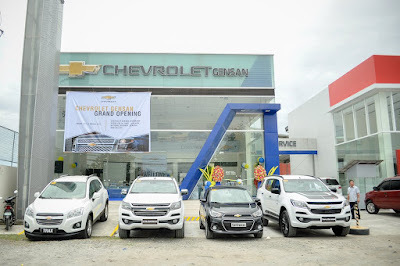 Chevrolet Philippines – The Covenant Car Company, Inc. (TCCCI), the exclusive importer and distributor of Chevrolet automobiles and parts in the country, makes its presence stronger in Mindanao with the grand opening of Chevrolet GenSan last March 31, 2017. Chevrolet GenSan features the brand’s signature goldenrod bow tie, signifying its promise of delivering quality products and services to its clients. The new facility also showcases Chevrolet’s new generation corporate identity standards, giving the dealership an inviting and family-friendly atmosphere. Adhering to the bowtie brand’s commitment of delivering quality service to its client, Chevrolet GenSan’s service center, with its trained and certified technicians, promises to provide exceptional aftersales service to its market. “The Angcore AB&T Group is proud to officially open our new Chevrolet dealership in General Santos City. We can’t wait to share our vision of ‘Making Life Better’ to our market. And with our new Chevrolet dealership, we want to give the Generals, as well as the rest of our South Cotabato friends, the best ownership experience,” said Mr. Tobi Ang, Vice President of Angcore Motors Corporation. A grand motorcade presented Chevrolet’s powerful lineup of vehicles, including the Chevrolet Trailblazer, Chevrolet Colorado, Chevrolet Trax, and the Chevrolet Sail. The event was attended by TCCCI executives and stewards headed by its Executive Director, Ms. Selene Lee Yu, together with Chevrolet GenSan and Angcore Motors Corporation’s Vice President, Mr. Tobi Ang. Chevrolet GenSan is located at Purok Palen, Brgy. Labangal, National Highway, General Santos City. It is the second dealership under the management of Angcore Motors Corporation and Chevrolet’s third dealership in Mindanao. Chevrolet GenSan shall feature a selection of models from Chevrolet Philippines’ best-selling lineup of vehicles, such as the mid-size Diesel SUV Chevrolet Trailblazer, DURAMAX-powered pick-up truck Chevrolet Colorado, city-smart crossover SUV Chevrolet Trax, powerful and efficient subcompact sedan Chevrolet Sail and the stylish and sophisticated mini car – the all-new Chevrolet Spark. Congratulations Chevy Philippines!! Mabuhay ka!! Mas OK ang Chevy dito sa Pilipinas. Sana maraming Chevy Dealers dito sa Pilipinas kung hindi lang sila Mahilig dun sa Kotse.